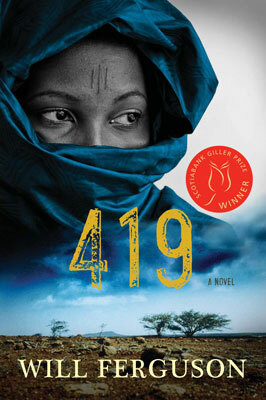 I want to start out by saying that I read this book before it won the Giller Prize! I picked up all 5 short-listed books when the shortlist was announced back at the beginning of October; but my for-fun reading time was quite limited and I didn't have time to read my way through the whole list. So instead, when I had some reading time, I picked up the short-listed book that interested me the most and lo and behold, a few weeks later, it takes the prize! I admit that I am a sucker for any book set in Africa, and that is probably why I picked this one out of the shortlist to read. 419 refers to the section of the Nigerian criminal code to do with fraud. I'm sure that anyone who is online receives these e-mails on a regular basis. "Dear Madam, I am writing you because .... Please send me $100 immediately by Western Union, and you will receive $100,000 in return..." Fortunately I have a good spam filter on my e-mail account so only see them in passing as I empty my junk folder! The premise behind this book is that an older man falls for one of these scams, loses all of his money and is about to lose his house, and commits suicide. His family is then left trying to put the pieces together to figure out what happened. At least that is the top layer of this story. What I loved about it is how gradually the author introduces seemingly unrelated story lines; and the reader gets to see the different story lines eventually converge in the end. Another story line is of the independent e-mail scammer working away in an internet cafe in Lagos, Nigeria, and how he gets drawn into the world of organized crime. Then there is the young girl who is pregnant fleeing her home in north-eastern Nigeria on foot. Then there is the layer of a young boy growing up in the Niger delta - known these days for the oil companies destroying the environment and causing violent conflict and kidnappings and murders. But it was not just the layered structure of this book that I loved. It has now been a month since I finished the book, and it is the images that have stayed with me. A young girl, on foot, walking through the desert. The absolute devastation to the environment, and thus to the people living there, caused by the oil industry in the delta. A slightly agoraphobic and neurotic woman flitting between her condo in Calgary and the food court downstairs. Will Ferguson is known mostly for his humour writing which I have never read, but based on this book, I will be picking up more of his books in the future. I have loaned my copy of this book to a friend. I had to leave it in her mailbox and so I e-mailed her the next day to make sure that she had received it. She replied that yes, she had it, and that she was half-way through it already and loving it! This looks like quite the read! I too, am sometimes drawn to books set in Africa, probably because there's so much sadness in that part of the world. Recently read, the amazing story, 'Running for my Life'- Lopez Lomong. It's set in Africa as well. Linda - yes, it was quite the read! I found that it went pretty quickly, and even though there are multiple layers to the plot, they are all easy to keep track of. I lived in Tanzania (East Africa) for 3 years, and love books that make me feel "home" again!